Autumn will soon be here. Extended due date for individual income tax returns will soon be here. IRS issues proposed regulations that make estate planning for family businesses urgent. IRS grants automatic relief for some late IRA rollovers. IRS will now issue rulings for corporate spin offs and split ups. Watch deadlines for California property tax assessment appeals. Watch big penalties for failure to file S corporation and partnership income tax returns. Visit our new article: Valley Speak. 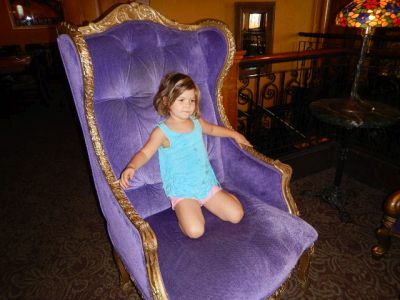 Princess Minerva enjoys holding court in her "throne" at The Old Spaghetti Factory. Labor Day seems like the "unofficial" end of summer, but the first day of autumn this year is September 22. This year will be ending before we know it! Are you ready? Holly Baker, who is my daughter, is celebrating her birthday this month. Kyan Baker, who is her son and my oldest grandchild is celebrating is twelfth birthday. Happy birthdays! We are in the midst of a second tax season. The extended due date for 2015 individual income tax returns is Monday, October 17. If you haven't given the information to finish your income tax returns to your tax return preparer yet, do it now! To make your appointment, call Dawn Siemer Mondays, Wednesdays or Fridays at 408-918-3162. The IRS has issued proposed regulations attacking family businesses, including popular family limited partnerships and LLCs. These entities are widely used for succession planning and to secure favorable valuation benefits for lack of marketability and lack of control. The proposed regulations do not apply to fractional ownership of real estate outside of a family corporation or family limited partnership. The IRS is using a "lapsing rights" argument under Internal Revenue Code Section 2704 to create a deemed right of liquidation based on family control of the business and claim a minimum value of an interest based on the net value of the underlying assets, instead of a going concern value. Going concern value has historically been the basis of valuation, and can result in a much lower value of the business interest when the assets have been underperforming. In addition, transfers during the three years before death or a gift would be disregarded. This would eliminate the ability to realize transfer tax savings from "death bed" transfers, even to unrelated persons. The proposed regulations are extremely complex and hard to understand. If you have a family business and your family could potentially be subject to estate and gift taxes, you should consult with a qualified estate planning attorney now. Consider telling your representatives in Congress that you oppose the proposed regulations under Internal Revenue Code Section 2704. The proposed regulations generally aren't effective until they are finalized, but the three-year rule could apply to certain transfers that are made before that date. A public hearing is scheduled for December 1, 2016, so the regulations won't be finalized until after that date. IRS grants automatic relief for some late IRS rollovers. The taxpayer or a member of the taxpayer's family was seriously ill. The IRS hasn't issued rulings about the qualification of corporate spin offs and split ups under Internal Revenue Code Section 355 since 2003. Now it has announced that, effective August 26, 2016, it will issue rulings whether (1) a distribution was carried out for a corporate business purpose and (2) a transaction is not being used principally as a device for the distribution of earnings and profits of the distributing corporation, the controlled corporation, or both. This is good news for corporations who need the assurance that a corporate division will be tax-free. The value for computing California property taxes is limited to fair market value on January 1. Occasionally, the county assessor will value a property higher than the fair market value. The property owner must appeal the assessed value by certain dates for the appeal to be valid. The filing period for appeals in Alameda, Inyo, Kings, Placer, San Francisco, San Luis Obispo, Santa Clara, Sierra and Ventura Counties ends September 15, 2016. For all other counties, the appeals period ends November 30, 2016. For general information on filing and presenting an appeal, see BOE Publication 30, Residential Property Assessment Appeals. Here is a web site with links to county assessor's offices: www.boe.ca.gov/proptaxes/assessors.htm. (Spidell's California Taxletter, September 1, 2016, p.5. "Filing property tax assessment appeals." American Orthodontics Corp., a Wisconsin S corporation, didn't file a California income tax return for 2010. The corporation wasn't subject to corporate income tax in California under federal Public Law 86-272, but had six salespeople working in California during 2010. The S corporation was found to be "doing business" in California and subject to the $800 minimum franchise tax. The corporation later realized it was subject to the California minimum franchise tax and filed the tax return on June 15, 2012. At that time, they weren't yet contacted by the Franchise Tax Board that a tax return was required. The corporation had 75 shareholders. The penalty for late filing is $18 per shareholder per month, for a maximum of twelve months. The Franchise Tax Board charged a $16,200 penalty. The State Board of Equalization upheld the Franchise Tax Board and said the reasonable cause exception didn't apply. The company failed to demonstrate reliance on its tax advisors in failing to file the tax return. The penalty was charged in accordance with California's tax laws. September 9, Michael Desmarais, attorney at law, "Why don't we just live together?" September 16 and 23, Michael Desmarais, attorney at law, "But my spouse agreed!" October 7, Bill Neville, Certified IRA Services Professional, The Entrust Group, "Making real estate investments in your IRA or Roth account"
October 14, Bill Neville, Certified IRA Services Professional, The Entrust Group, "Making alternative investments in your IRA or Roth account"
October 21 and 28, Nancy Ross, Bauer Shepherd & Ross and Associates, "How a collaborative approach can make a divorce a less painful process"